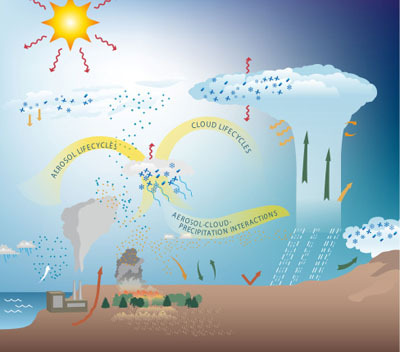 Determine the properties of and interactions among aerosols, clouds, precipitation, and radiation that are most critical to understand, in order to improve their representation in climate models. Ascertain the roles of atmospheric dynamics, thermodynamic structure, radiation, surface properties, and chemical and microphysical processes in the life cycles of aerosols and clouds, and develop and evaluate models of these processes. Identify and quantify processes along the aerosol-cloud-precipitation continuum that affect the radiative fluxes at the surface and top of the atmosphere and the radiative and latent heating rate profiles, and improve the ability to accurately model these processes. For a complete summary of ASR science, read the Atmospheric System Research (ASR) Science and Program Plan.